We welcome you to the April issue of INSIDE ATLAS.ti. As always, we present you with the latest news regarding our company and products, give you an overview of the training services scheduled for the next two months, and offer you best practices and case study articles. In the Best Practices section, we explain a procedure that might not be widely known among ATLAS.ti users: to code inside of a network view. You will notice that in this article we link to a set of short video tutorials which demonstrate the procedures explained in the article. I hope you find this useful. In the Case Studies section, we interview Dr. Eva González, from the Tecnológico de Monterrey Campus Guadalajara, Mexico. Dr. González gives us an overview of the virtual ethnography study in which she used ATLAS.ti. On April 6th, a new update of ATLAS.ti Mac was released, bringing the program to version 1.0.45 (185). This update introduces a new reporting tool. Now, besides Excel, you can also create reports in the following file formats: DOC, DOCX and ODT (OpenOffice). These reports can be created in relation to any object of the project, such as documents, quotations, codes and memos. Watch these two video tutorials which explain and demonstrate this new reporting function: Reports in #ATLAStiMac and ATLAS ti Mac-Reports in Word. To check for new updates in ATLAS.ti Mac, go to ATLAS.ti on the main menu on top and select ‘Check for Updates’. Make sure that the box for downloading updates automatically is selected. You may also watch this video tutorial showing the procedure. Click here for a video tutorial showing how to check for updates in ATLAS.ti 7 Windows. The ATLAS.ti Research Blog is now located at a new URL. Now, you may access it at http://atlasti.com/topic/blog/ and at www.blog.atlasti.com. Bookmark it! The ATLAS.ti Research Blog plays a very important role in the development and consolidation of the international community of users. Consultants, academics, and researchers publish short and practical articles highlighting functions and procedures with the software, and recommending strategies to successfully incorporate ATLAS.ti into a qualitative data analysis process. We invite you to submit short articles explaining interesting ways of making the best use of ATLAS.ti, as well as describing how you are using it in your own research. To do so, please contact us. In early March, the ATLAS.ti team was in Valencia, Spain, for the 10th Annual International Technology, Education and Development Conference (INTED2016). Many researchers, professors, and students came by the ATLAS.ti exhibit, ranging from ATLAS.ti users to those who had never heard of the software. People showed interest in learning about the software and were especially keen on the free demo and Android/iPad versions of ATLAS.ti. The conference was an overall success, and we are grateful for the opportunity to have met people from so many different parts of the world—over 80 countries were represented! The winner of the ATLAS.ti raffle was Ajda Osijo. Ajda is an English language instructor currently working in Dubai and completing her doctoral studies. She was born in Bulgaria, raised in Turkey, and is passionate about integrating technology in educational practice, along with the social constructivist approach to teaching and conversational analysis. Congratulations Ajda! The ATLAS.ti team in Latin America has implemented a strategic alliance with the ATLAS.ti workshop offered annually by the Center for Applied Statistics and Informatics, a center associated with the Latin American Faculty of Social Sciences (FLACSO Buenos Aires) and the Institute of Economic and Social Development. As part of this alliance, our team in Latin America provides technical and commercial support to the workshop. The next workshop will be taught by Lilia Chernobilsky, certified professional trainer, and Maria Guillermina D’Onofrio. The course will focus on the qualitative methodology research design and the role that ATLAS.ti plays in facilitating data analysis processes. Classes are scheduled for April 5th to May 24th. For more information visit the course website page here. ATLAS.ti is restarting its roadshow program in South America, now that universities from that continent are back from their summer holidays. 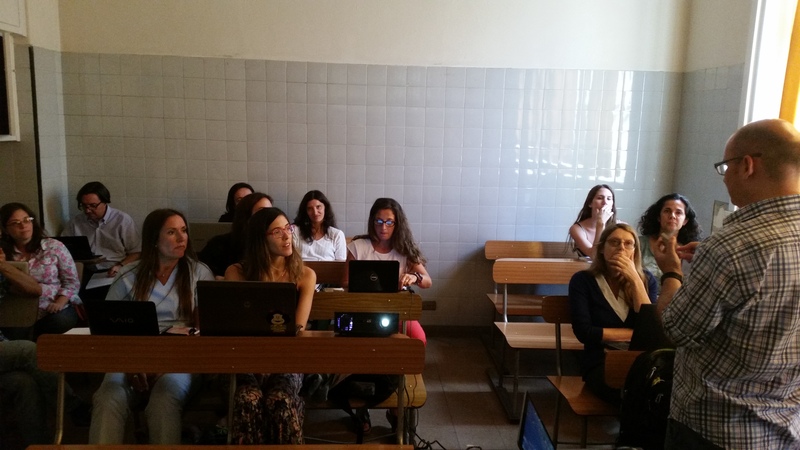 In March, our team in Latin America visited the School of Nutrition at the Universidad de Buenos Aires (UBA) and in April a visit is planned to the National Institute of Epidemiology of Argentina. Also in April, our team will teach a workshop at the 12th Colombian Sociology Conference, in Pasto, Colombia. If you are in South America, Spain or Portugal, and would like to receive a visit from our team, do not hesitate to send us an email (Spanish and Portuguese spoken). On 26th of March 2016, the ATLAS.ti training team was again invited to speak at the famous Seminar Jom Hebat Pascasiswazah Series 11.0 in Selangor, Malaysia. Our Manager of International Projects for the Training & Partnership Development, Ani Munirah Mohamad, spoke about doing literature reviews using ATLAS.ti to an audience of 120 delegates from various colleges and higher learning institutions in Malaysia. The seminar, which in English means: Let Us Become Great Postgraduates! has been organised by the Malaysian Postgraduate Workshop Series (MPWS) since the year 2014. The seminar provides a platform for postgraduates to learn various topics related to postgraduate studies, such as research methodologies, writing process, publication and handling postgraduate life. Since its inception, the Seminar Series have attracted approximately 3500 delegates! We would like to take this opportunity to thank MPWS for this joint venture and cooperation for all these years and many more years to come. If you have not done so yet, check out a video on the iPad ATLAS.ti Mobile application made by the Department of Educational Foundation and Research at the University of North Dakota. Very well done! Watch it here. Are you using ATLAS.ti in interesting projects and would like to share your experience with the international community of users? If so, we invite you to contribute to our Case Studies section of INSIDE ATLAS.ti. To do so, simply complete this questionnaire. We will contact you soon after receiving your submission. Thank you! ATLAS.ti offers a variety of resources that facilitate the learning of the software. These include a complete library of video tutorials, weekly webinars, workshops, as well as a set of manuals and how-to documents. For more information on our learning resources please contact the staff of our training center. They will be happy to assist you. In the United States and Canada, you may call us toll free at 1-866-880 0231. If calling from other countries, dial +1-541-286-4391. You may also write to us at [email protected] and access all of our training resources on our website by clicking here. If your organization is evaluating ATLAS.ti, or if you want to introduce it to your students or at a professional meeting, schedule a presentation with one of our instructors. We will be happy to tailor the presentation to your needs. To schedule a presentation, please complete this registration form. For group demo webinars in Spanish, complete this form. We are now offering free overview webinars at a time convenient for people from Europe and Africa time zones. The webinars are taught on Fridays at 10: 00 am GMT. They are taught by Dr. Steve Wright, from the University of Lancaster, UK. You may read here a short bio of Dr. Wright. To register for these webinars, please click here. Literature reviews ATLAS.ti 7 Windows. English. Register here. Literature reviews ATLAS.ti Mac. English. Register here. Literature reviews ATLAS.ti 7 Windows. Spanish. Register here. Literature reviews ATLAS.ti Mac. Spanish. Register here. Multimedia analysis with ATLAS.ti. English. Register here. Our premium training activities include online synchronous and asynchronous courses, face-to-face workshops and and on-demand worldwide. Click here to see the entire calendar of training events currently scheduled. There you may read the course outlines and register for the course of your preference. This time, we want to highlight the face-to-face workshops scheduled for April and May. April 14th, 15th and 16th. Qualitative Analysis with ATLAS.ti 7 Windows. Corvallis, Oregon. USA. Click here. May 9th and 10th. Introduction to ATLAS.ti 7 Windows. Chapel Hill, North Carolina. Click here. May 19th, 20th and 21st. Qualitative Analysis wit ATLAS.ti Mac-Small Group. Click here. May 10th. Analysis Tools. Hannover Germany. [Taught in German]. Click here. May 13th. Introduction to ATLAS.ti 7. Madrid, Spain. [Taught in Spanish]. Click here. April 16th. Literature Reviews with ATLAS.ti 7 Windows. Kuala Lumpur, Malaysia. Click here. May 14th and 15th. Qualitative Analysis with ATLAS.ti 7 Windows. Kuala Lumpur, Malaysia. Click here. This month we interview Dr. Eva González, professor of marketing and business at the Tecnológico de Monterrey in Guadalajara, Mexico.